Making a delicious side dish cannot get any easier. Only carrots, olive oil, salt and pepper and about half an hour roasting time. This is one of my go-to recipes whenever I feel that making a salad involves too much work!!! This or boiling frozen peas and carrots in water. 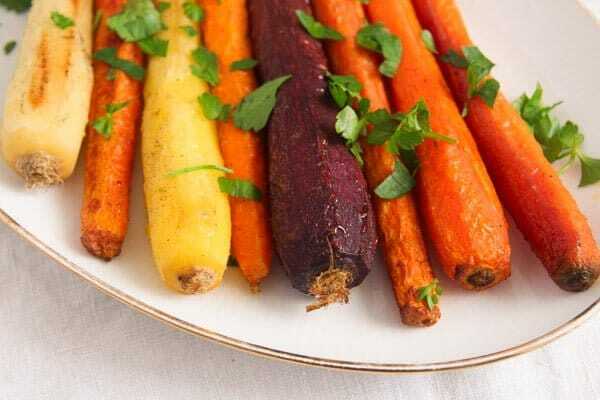 And I like these carrots much better: they are sweet, slightly crunchy, you can actually taste their full carrot flavor better than in most other dish. I used to be a “salad as a side dish” person for a very long time and made cooked vegetables side dishes mostly when cooking German dishes that always come with one or two vegetable sides, things like the above mentioned peas and carrots, the German Stewed Red Cabbage with Red Wine, Brussels sprouts in white sauce or cooked green beans. This is the typical way of German eating, I would say: a meat/fish dish accompanied by boiled potatoes and cooked vegetables. This sounds very basic, there are, of course, countless variations on this theme, but if I was to put it in one sentence, that would be it. Different from the Romanian way of cooking and eating, I grew up with dishes that were mostly a one-pot stewy affair accompanied mostly by fresh chopped vegetables when in season or by pickled vegetables in winter. As my husband’s taste buds are not familiar (and refuse to become familiar) with pickled vegetables, unless they are sweet-and-sour gherkins (sweet being the only reason he likes them here), I went for salads and you will find a salad on our table almost every day. However, lately I got into cooking veggies as side dish more often. And roasted vegetables are so much better than just boiled ones, aren’t they? Just a bit of olive oil, some spices and you’re done. 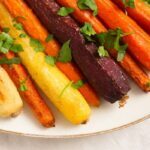 This is a very basic recipe for roasting not only carrots, but countless other vegetables, try Brussels sprouts, broccoli or cauliflower florets, even green beans can be perfectly roasted in the oven in this very simple manner. The only thing you have to keep in mind is to adjust the roasting time accordingly. And when it comes to spices there is really no limit. Choose coriander, cumin or za’atar for a Middle Eastern version, sweet and hot paprika for a more Eastern European one, oregano or other herbs and some lemon zest for a Mediterranean touch, turmeric, garam masala or any curry powder you like for an Indian flavor. Whatever combination you choose, I can assure you the vegetables will be delicious! Use similar sized carrots and if there are some larger ones in the bunch, halve them lengthways. I like using rather thin carrots for this purpose, but if all I have are thick ones, then I just halve or quarter them lengthways. 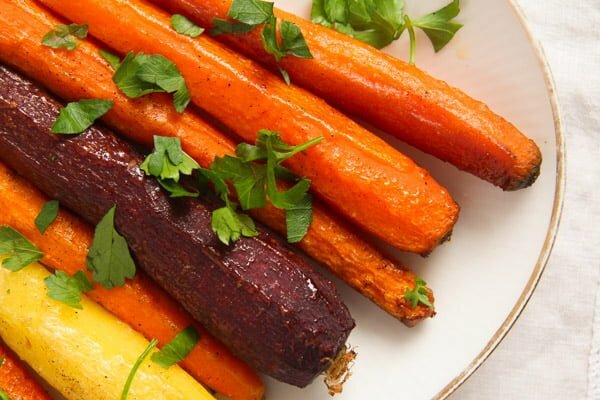 I used these beautiful colorful carrots because I happened to find them at the supermarket, which is kind of miracle around here. However, regular carrots will do just as well. 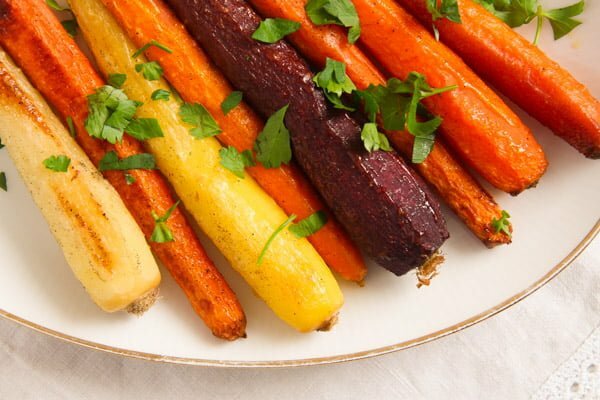 Use a little olive oil, but do not overdo it, the carrots should all be glistening with oil after you have rubbed them, but they should not sit in little pools of oil. After the initial 10 minutes roasting time, check the carrots often to see when they are done to your liking. The total cooking time really depends on the size of the carrots and your oven. I like my carrots to still have a bit of a crunch, but you can leave them longer in the oven if you like them softer. Take 3 or 4 carrots per person, depending on their size. Make sure the roasting pan is large enough to hold the carrots in a single layer. Peel the carrots or scrub them very well if they are organic and the peel looks fine. Make sure to dry them very well. 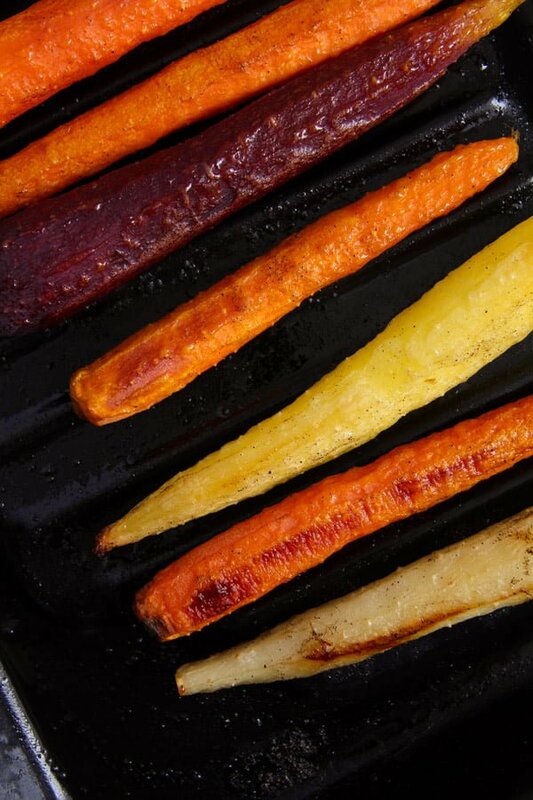 Give the carrots to a roasting pan that is large enough to hold all the carrots in one single layer. Pour the olive oil on top and rub the carrots well until they are all coated in oil and spices. Sprinkle with salt and pepper. You can use other spices as well, see above (the blog post) for suggestions. Cover the dish tightly with foil. Roast the carrots for 10 minutes. Remove the foil, shake the pan and continue roasting the carrots for 10 further minutes. Turn the carrots in the pan or shake the pan again and continue roasting the carrots until done to your liking, about 6-7 extra minutes in my case. The cooking time will greatly depend on the size of the carrots, your oven and your personal taste. 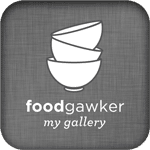 I like crunchier roasted carrots and I find that thinnish carrots are done to my liking after this period of cooking time without foil, but you can cook them for a longer time, if you prefer them to be softer. Aww, the carrots look amazing. 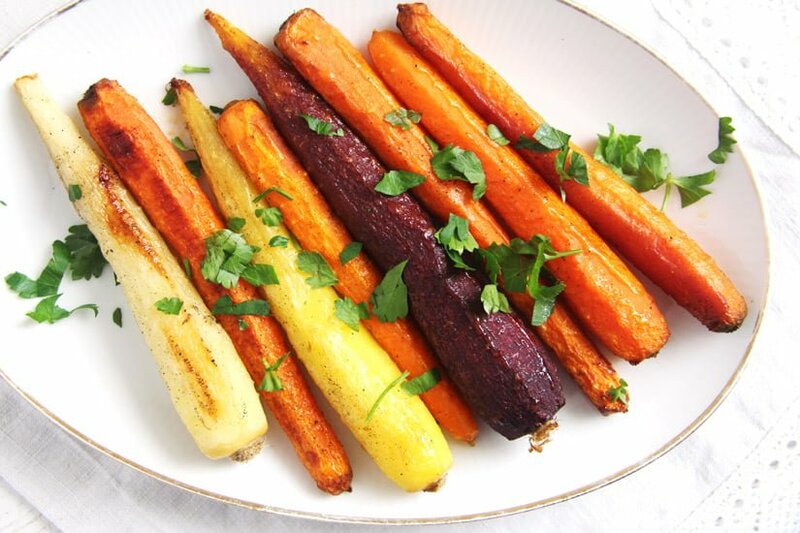 I love heritage carrots, with different colours, really festive and delicious.